Centerwork: Does Gender Matter in Class? Jennifer Chin recalls this scene from her early days as a dancer: In a class of 40 students, only five would be male. And all five would receive corrections from the instructor, compared to just two or three females. But as a result, talented women may be overlooked or have to work twice as hard for the same recognition as the guys. And in some cases, gender overshadows a particular student’s potential or drive. Growing up, Paul had the experience of being in class with boys who lacked commitment but still dominated the teacher’s time. “It’s frustrating for the female dancers who are putting their heart and soul into every technique class, and attention is being placed on someone who doesn’t want to be there,” she says. Rogers appreciates “the gauntlet that men dancers have gone through” but notes that women have their own cultural challenges. Girls aren’t always socialized to fight for the spotlight, or to speak up when they feel they’re being treated unfairly. “What we aspire to is freedom from gender roles, but it might not happen in a given class,” says Rogers. Men do often get a tuition break, however, creating another source of resentment for female students. As in many schools, Flachs makes financial accommodations for male dancers so that he’ll have enough partners for the ladies. But even with scholarships, the shortage persists—and that can have downsides for the men as well as the women. Daniel Grzelak, a former student of Flachs’ who now studies at the Pennsylvania Academy of Ballet, wishes he had more peers to motivate him. “It would be better for my training if I had competition,” he says. The lack of male dancers also leads to uneven performance opportunities. “That’s where you really see the discrepancy in university settings,” says Chin. “Men get more roles and better roles.” It doesn’t help that many classic works that colleges set, like Paul Taylor’s Company B, require multiple male artists. Montclair’s dance department sometimes has to poach musical theater majors to fill the parts. Chin thinks schools with programs that are 75 percent women should choose repertory that features them, or have separate male and female casts for the same piece—like Montclair has done in the past. A former dancer, Elaine Stuart has written about the art form for The Wall Street Journal and The Brooklyn Rail. 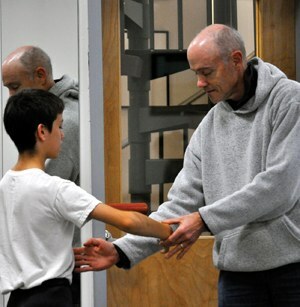 Charles Flachs works with student Liam Saito at his studio in Massachusetts. Photo by Carrie Homstead, Courtesy Flachs.